Come sing, dance and learn with your little one! 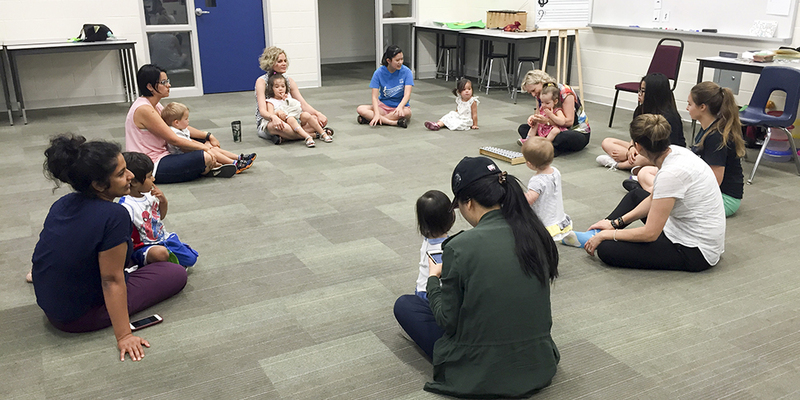 Our Early Childhood Music (ECM) program offers classes for children ages 0-4, using percussive instruments, movement, songs and rhymes to help your child develop a love of music and an understanding of musical language. Our ECM classes are offered throughout the school year, with class times available on Wednesdays, Thursday and Saturday. See a list of Q&As regarding our ECM program. Create an account on our web site. On the Family Profile page, we ask for birthdate, instrument, level, etc. For ECM students, we only need birthdate. Click on “Group” and then on the “Register” button beside the “2017-18 Early Childhood Music” class. ECM fees include the OSA membership fee. When a family joins our ECM program, they become OSA members (at a reduced rate). This means our ECM families are welcome to attend our concerts and special events. Come and be inspired by the older kids!